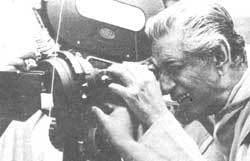 SATYAJIT Ray's formidable body of work has given both-form and substance to the cultural landscape of the nation and, thereby, helped shape its cultural consciousness. The range is astonishing: from period pieces like Charulata and Jalsaghar to films with a rural setting like Pather Panchali and Sadgati, to works like Mahanagar and Agantuk which explore the collapse of human values against the harsh urban environment of modern India. In conversation with friends and journalists, Ray repeatedly emphasised his rootedness in the life of Bengal and Calcutta, which he knew intimately and at first hand. It was this conscious insistence on setting his.work in the relatively small world he lived in and experienced that gave his work a bedrock of truth. But clearly this is not enough. All great art must, in its own way, be truthful, but truthfulness alone is no guarantee of greatness. There is, in the best of Ray's work, an apparently effortless yet carefully crafted transmutation of the local into the universal which rescues it from being tied down by the richness of its local flavour. Ray does this through his delineation of the environment in which his characters live and which con tinuously shapes and reshapes their lives. At the same tim"e, Ray was no naturalist and has, as such, no specific viewpoint which he brings to bear in his treatment of nature. His primary interest is the human being. The environment is of interest to the film-maker only in so far as it impinges on,human life. Even his earliest films reflectedthis. The pastoral backdrop of Pather Ponchali, for all its mango trees and sugarcane fields, is never allowed to swamp the tragic impoverishment of Harihara's family. In Ashani Shanket, the film-maker explores the politics of famine against the ravaged Bengal countryside, with its skies darkened by carrion crows and land that won't yield a fistful of rice. The same sure touch is evident in the other two films of the Apo trilogy or in Paras Pathar, lalsaghar and Devi. Especially, evocative and powerful were Ray's portrayals of the monsoons. But it may also be asserted with some justification that in these films Ray was-in his own imaginative way transcribing into the medium of the film the demands of the original literary pieces which formed the basis of his screenplays. This is particularly true of the Apo trilogy; Bibhutibhusan Bandopadhyay's evocation of nature in rural Bengal was so rich in detail and so plentiful in variety that no major additions in content seemed necessary from the film director. Even so, many of Ray's own contributions to the screenplay - such as Apo's reawakening to his responsibilities (in Apur Sansar) through a wordless communion with the sights and sounds of a forest - have the natural order as its centrepiece. We must turn to Kanchonjungha for the first, reasonably comprehensive statement of Ray's own perception of b '9w nature impinges on human relationships. Here, in his first original screenplay, Ray chose to examine dominance and-freedom, sympathy and forgiveness, loneliness and-empathy within a limited frame of space and time, But there is nothing limited in the natural backdrop of the Himalaya against which a subdued human drama is enacted. Darjeeling is an ideal locale as the film-maker wishes to describe cinematically the remaining vestiges of English snobbery in the upper-class Bengali. The beauty and majesty of the natural surroundings are an intended contrast to the pettiness and meanness of human concerns; those of the characters who show true generosity and warmth seem to be the ones who are in silent communion with their environment. Indeed, the one character etched by Ray with the greatest sympathy is an obsessive birdwatcher who, for all the accoutrements of modern civilisation, is forever distracted by the twitter of birds. In most of his films, Ray has been the artist of understatement and confined himself to throwing mere hints. Aranyer Din Ratri (Days and Nights in the Forest) is an extended essay in understating the complexity of human emotions displayed in a setting that is closely integrated with the natural order and far removed from that of "civilised" society which seem to twist human relationships in ways foreign to their netral selves. Is civilisation primarily repressive in character? Is it ever possible for people to discover their true selves unless they place themselves in surroundings which have not been despoiled by human activity? There is a suggestion that honesty and integrity are to sougt in the simple lives of tribals but the suggestions left, as it were, as a query with an ambiguous answer. In Agantuk, his last film Ray felt the urgency to speak without ambiguity and circumspection. The decay of urban life and the collapse of values in present day India has been stark enough to provide this sense of urgency. His own illness and consequent infirmity may, at a personal level, have provided a supplementary impulse. The suggestions of Kanchanjungha and the suspended query of Aranyer Din Ratri have given way to an anguished cry here. People, in divorcing themselves from the natural world, have also divorced themselves from all that is good and honest in themselves. From primitive beings illustrating cave walls with untamed bisons, human beings have regressed even while imagining that they've progressed. Perhaps nothing illustrates Ray's intrinsic feel for his environment more than his increasing use of natural sounds as a replacement for composed music to highlight the most expressive moments of high cinema. The defeated but unbowed protagonist of Pratidwandi leaves town for the seclusion of the village. To evoke what he has gained in the bargain, all Ray needs is the call of the cuckoo. The innocence, freedom and spontaneity of childhood is recalled with a power and an economy of means which is hard to match. In contrast, the horror of a lonely death in Ashani Shanket requires no more than a bird call - is it the woodpecker? - to remain imprinted in a viewer's memory forever. Ray's long and productive career as a film-maker is now at an end. Natives of Calcutta, of the Bengali-speaking world and of Indian society at large were fortunate in having in their midst an artiste with such a profound gaze, who spent a lifetime in revealing the deepest truths of overlapping worlds in a language and style that can be universally understood. Kamal Datta teaches physics at Delhi University.